Five games into the NBA Finals, the rebounding has leveled out with Cleveland holding about a two percent edge over Golden State on both the offensive and defensive glass. That’s meant a bit more for the Cavaliers, the underdog that could use every possible chance to score. Arguably the least flashy effect of Cleveland’s rebounding has been drawing the loose ball foul. Those are like the rebounder’s version of the and-one, and they happen almost as frequently, or in this case rarely with loose ball fouls occurring 1.3 times per game this season compared to 1.9 times for and-ones. Cleveland drew 1.5 loose fouls per game over the season, and 1.3 in the playoffs until the Finals. Exciting to read about something that happens not even twice per game, right? Those versions of the Cavaliers weren’t like the current, though, and in the last five games they’ve drawn an average of 3.8 loose ball fouls, or 16 percent of Golden State’s total committed fouls. That’s a small, but consistent sample size as Cleveland’s drawn between three and five each outing. It’s not like David Blatt is telling their players “go out there and draw some loose ball fouls,” but given the rebounding edge they’ve had to lean on to give them a chance this series, Cleveland’s rate seems sustainable not for 82 games but at least two more. It’s a little thing, one of several, that they wouldn’t mind going their way during their quest to win two straight games. Should that rate of drawing loose ball fouls continue, it’ll also impact the rebounding rates of Thompson and Mozgov, who have drawn 18 of those 19 fouls for Cleveland. Unlike at the college level, the NBA rarely credits the player drawing those fouls off a missed shot with the rebound, logged instead as a board by the team. 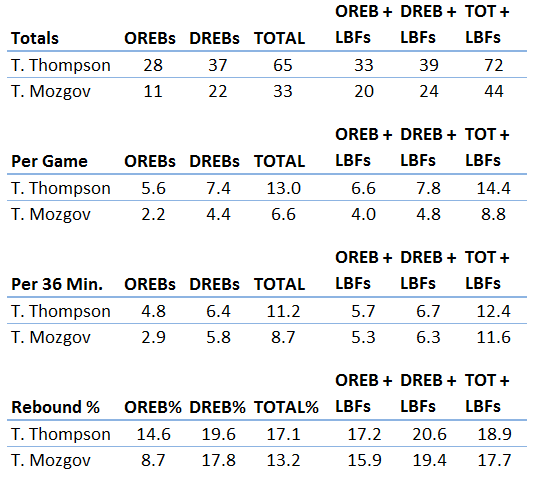 Something tells me Thompson and Mozgov wouldn’t mind more appreciation for their efforts. With that in mind, I looked at their current rebounding rates and what they would look like if we gave 18 of those 19 team rebounds to Cleveland’s starting bigs through the first five games. That’s a pretty noticeable difference so far, especially for Mozgov. His per game numbers and overall performance in the Finals took a hit after what happened in Game 5, but Mozgov’s rebounding woes were patched up after adjusting for minutes and the three loose ball fouls drawn on Sunday. He’s done a good job getting position for a rebound after running pick and rolls with LeBron James, and Festus Ezeli has often been the player to foul Mozgov on those plays. Thompson’s speed has been a problem at times for some guy named Andrew Bogut while he’s drawn a few fouls on Harrison Barnes partly from his strength, though Barnes has gotten his fair share of offensive rebounds too. Thompson seems to both have a knack for where the ball will deflect off the rim and a refusal to let his opponent box out a zone. He never stops moving, and it takes ridiculous endurance to do that for over 40 minutes a night like he has during the Finals. Unfortunately for the Cavaliers, those drawn fouls haven’t exactly propelled them to four straight wins. How shocking that just one part of a basketball game hasn’t shifted an entire seven-game series, but among other loose ball fouls, the one David Lee committed against Thompson near the end of Game 3 stuck out. It looked like it sealed the Warriors’ fate, but Lee’s foul was also sneaky smart and I think he knew it, never objecting to the call. He used the foul as soon as Thompson was a near-lock to get the rebound, so either Lee gets away with that foul and has another chance at the rebound or he puts a mediocre free throw shooter in Thompson at the line, who was fouled instantly to give the Warriors an extra possession to cut into the 80-87 deficit. I could be giving Lee too much credit, but it’s a good example of why context matters and how we still don’t have much of it to work with when looking at fouls. At the same time, I don’t think it hurts to try to look at them on paper anyway. All statistics are from Basketball-Reference. Rebounding percentages were calculated at SacTown Royalty.